Climate change and new technologies mean the fruit sector is constantly evolving, and producers can get ahead of the curve at this year’s Fruit Focus. Profiling the latest innovations and developments, it is the key industry event, helping growers to become more efficient and to push the boundary on both yields and quality. 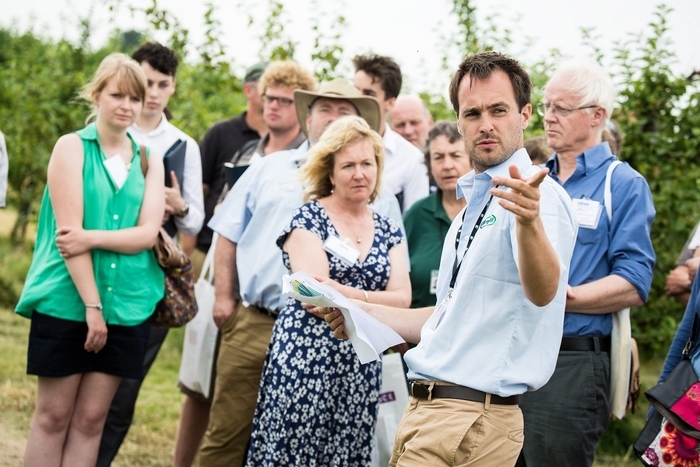 Tickets are now on sale for the event, which will attract more than 1,300 growers and 120 exhibitors to NIAB’s EMR facility in Kent on 25 July. Following the extended spell of dry weather, and with new abstraction licences coming into force, irrigation will be a hot topic; and growers can see the latest innovation in the Water Efficient Technologies (WET) Centre. Opened last year, it features a fully automated Precision Irrigation Package, which has proven to reduce the use of water, fertilisers, pesticides and energy by 20% while also delivering up to a 10% increase in strawberry yields. As usual, the latest issues will be discussed at the NFU Forum, with practical advice to see growers though the changing political landscape. This year the topics include: Building resilience before Brexit, and the robots are coming, or are they? The forums will update growers on changing agricultural policy and its likely impact, as well as offering ideas on how they can build resilience. Visitors can also explore how agri-tech could be the answer to protecting and growing fruit post-Brexit. NIAB EMR is holding a forum looking at precision growing of soft fruit, encompassing new innovations and technologies to enhance crop productivity, resilience and quality. Despite some challenges associated with Brexit, these are buoyant times for the viticulture sector, with English wine releases reaching a record high in 2017. Those wishing to improve their knowledge on market trends, profitability and business planning for vineyard establishment should attend the WineGB forum: Economic viability of viticulture.